We are sure that Dev Saab will never forget his friend and will cherish the moments and success that they shared forever. So will we. This entry was posted on Saturday, July 7th, 2007 at 9:50 am	and is filed under Kishore diary. You can follow any responses to this entry through the RSS 2.0 feed. You can skip to the end and leave a response. Pinging is currently not allowed. I don’t really understand the lyrics of the opening title here (I do speak Hindi but not nearly as well as I should since I grew up in US). It is a CHILDHOOD favorite and my earliest remembrance of Kishore Kumar along with his classics that he sang for Amitabh in the 70s and especially 80s (I was born in 1985). Great combination. Thanks for article. Once again the credit goes to S D Burman and Majrooh Sultanpuri Combo. S D Burman’s invention for composition of songs for couples in joyfull mood helped Kishore in establishing a full flagged singer in the 50s and becoming one of the main voice for Dev Anand. The above article doesn’t mention any thing about S D Burman or Majrooh. 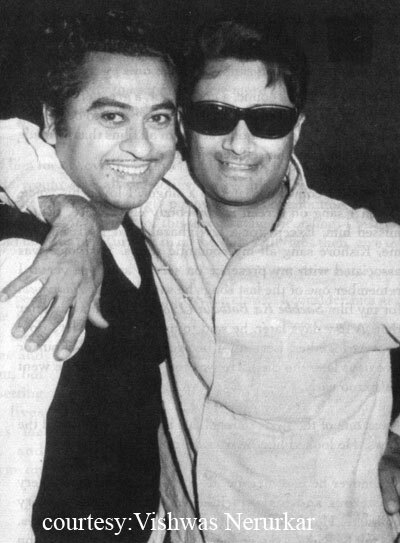 Dev Saab and Kishore were an inseparable pair. The article truly brings the bond between them. Once in a concert in Mumbai, Amit Kumar narrated this incident. Long after Kishoreda’s passing away one day Dev drove to Kishoreda’s house and kept looking at his portrait in his home and kept saying”jaldi chalagaya” repeatedly. Such was their friendship, I guess. I am a die hard fan of both of these legends, which I am proud of. Dev Anand all were parts of a great combo. It is unfortunate to lose the great humanbeings, especially the legends like Kishore da. We are seeing him through his voice. It is indeed a graet loss to us. The versatality ofthis great singer is that he sings to the tune of heros. Some of the heros has become superstars after being sung their songs by Kishore da. Many Many Happy retuns of the day (04/08/2007), Kishore da amar hi, henis alive through his songs even today & years to follow. I pay great respect to the legend Kishore da. great picture man continue that way. one of my favourites of the duo is”phoolon ki raang se dil ki kalam se…………………………………………lena hoga janm hume kaye kaye baar”.A great and relevant article but plz try to post more pictures of the legend with various music directors and other personalities. this is a very nice picture. both kishore da and devanandji are my all time favourites.